When we were teens we loved all the new places that were available to have social events. Previous to that, everything happened in homes. But now after all this time, it is becoming more and more appealing and less expensive to celebrate at home. 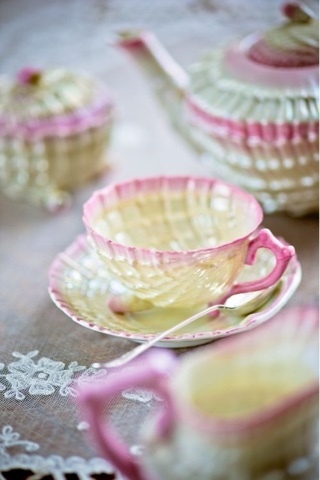 This picture fromPinterest is a seashell tea set. Home celebrations are quite nice. They may be located in many places. In the yard if there is sufficient shade of a tree, under a patio cover or tent awning,even a vegetable garden, orchard, or down by the creek is refreshing on a hot afternoon. A living room with a fireplace is delightful on cold Winter days or evenings. In a dining room near a picture window that allows light and a view is fun also. I've heard of "Have Tea Will Travel" ministries who take tea by basket to shut-ins and the elderly or a sick friend. Years ago I took a tea class taught at a local community college. Some friends and I were invited to tea at the instructor's home a week or so after the class. She had taken an extra bedroom and turned it into a makeshift tea parlor complete with lace curtains at the windows, a bead curtain over the door, pretty feminine paintings on the walls, a small portable fireplace heater with reflective faux fire, a table and chairs, small lamps and battery operated candles, a vanity became a buffet, table and she had stocked the closet shelves with a variety of teas, tea paraphernalia, tea books and tea jewelry for sale. She used a stacking plate rack and filled it with melt in your mouth cream scones, little tea sandwiches, and a variety of sugared and chocolate dipped fruits. There was a nice assortment teas in hot teapots and pretty place settings of salad plates, a lace serviette napkin,real silver plate flatware, mismatched tea cups and saucers. We were each treated to a pretty little spoon tied with a ribbon and a bible verse as a gift, as if the tea and lunch weren't enough. The whole experience was a lesson in itself and such a graceful gift from her to us. I will never forget that day or her friendship. Celebrations can be as simple or elaborate as you like, just use the time to celebrate one an other. The shell tea set I have seen a few times in my life. Does anyone know what company makes it. It is so beautiful and fragile. There truly is no place like home!! 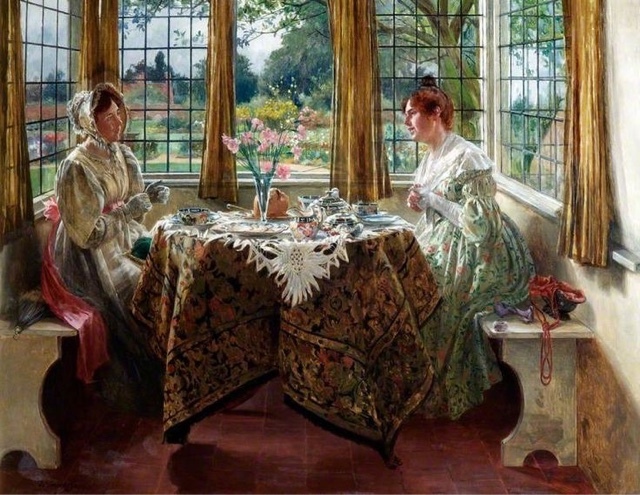 Love the painting and the tea set. Such loveliness! Have a delightful week Lydia!